Over the last two weeks, there have been two deadly attacks in the Shi'a holy city of Karbala' (Al-Karbala'), located about 50 miles south of Baghdad. Karbala' and Najaf (An-Najaf), its sister city to the east, are the two holiest sites in Shi'a Islam, following of course, Mecca (Al-Makkah), Medina (Al-Madinah) and possibly Jerusalem (Al-Quds). Why is Karbala' a repeated target of the Sunni insurgent groups and Al-Qa'idah in Iraq (AQI)? Since the beginning of the the "surge" operation in Iraq, the Shi'a have all but stopped their participation in the sectarian violence that has plagued the country after the AQI attack on the Al-'Askari mosque in Samarra'. (See my earlier piece, Iraq - Attack on Major Shi'a Shrine in Samarra'.) With declining sectarian violence, American and Iraqi forces have concentrated on operations against the Sunni groups. The Sunnis are attempting to goad the Shi'a into re-igniting the civil war, hence the vicious, horrific attacks on Shi'a market places, mosques, schools, housing areas and government officials. So far these efforts have been unsuccessful. The Sunnis believe that if they can inflict significant damage on a shrine revered even more than the mosque in Samarra', the Shi'a will again fight. 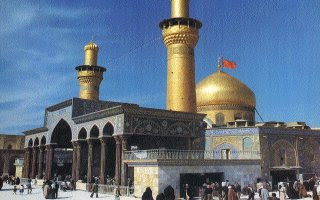 Karbala' is the location of the shrine of Imam Husayn (Hussein). Imam Husayn is revered by the Shi'a as the son of 'Ali ibn Talib, the son-in-law of Muhammad. Following the death of Muhammad, many prominent Muslims of the day thought that the position of successor (khalifah, from which the word "caliph" is derived) should be drawn from the educated ('ulayma') leadership of the community. Others believed that it should be a bloodline from the prophet - these were the "partisans" (shi'a) of 'Ali. This is the source of the differences between the two sects. There was a brief period of convergence when 'Ali was named the fourth (Sunni) caliph as well as already being the first Shi'a imam. However, 'Ali was murdered and his son Hasan named second imam. Hasan abdicated to the 'Umayyad (Sunni) leadership in Damascus, and his brother Husayn picked up the mantle of leader of the Shi'a as the third imam. Husayn was killed in battle against 'Umayyad forces at Karbala' on the tenth ('ashurah) day of the Muslim month of Muharram in 680AD, the day now celebrated by the Shi'a as their holiest day. In 1988, Saddam Husayn named the first Iraqi modified Scud missile the "Al-Husayn," hoping to portray the war effort in an Islamic light. Most observers assumed that he had named the missile for himself, but in Arabic naming protocol, Husayn is actually his father's name. If he had named the missile for himself, it would have been the "Saddam." It was a logical assumption - when I was in Baghdad at that time, many things were named for Saddam, and his picture adorned almost every vertical surface in the city. If the Sunnis can cause massive damage to either the shrine in Karbala' or the shrine of Imam 'Ali in An-Najaf, they just might be successful in restarting the civil war and drawing off some of the focus of the American and Iraqi forces.